As many as 2,000 of baby flamingos were recently airlifted from their drought-affected habitat in northern South Africa in a frantic attempt to rescue them. The chicks were moved to various locations around Cape Town. 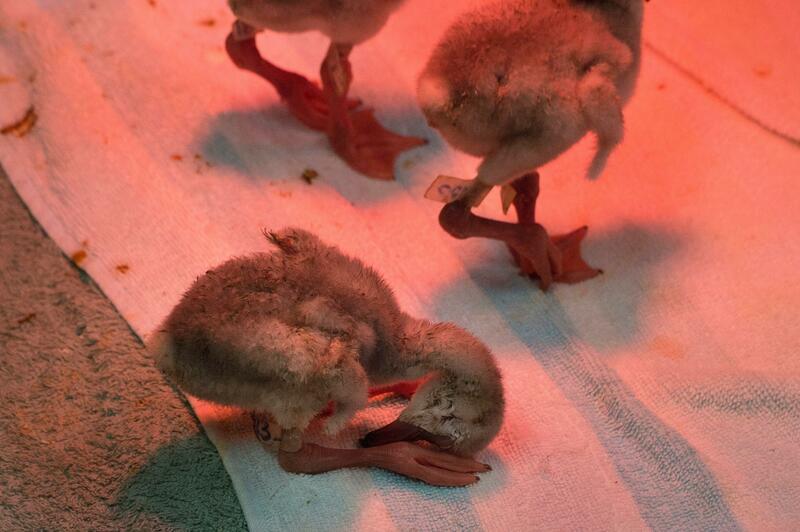 According to reports, the Lesser Flamingo chicks were rescued from the Kamfers Dam near Kimberley, North Cape, after they were deserted by their parents after the dam dried up. Nicky Stander, the rehabilitation manager at the Southern African Foundation for the Conservation of Coastal Birds (SANCCOB) in Cape Town said her team immediately took action after hearing the news about the birds in January. The foundation works toward the rehabilitation and release of the birds in the wild. “As time goes on and they grow, we are going to have to adapt the way that we house them and make sure that they have long running space, so they can exercise their legs,” she said. Some of the chicks were put in an incubator at a rescue center in Cape Town where they are regularly fed, weighed and cared for the members of SANCCOB. “They’re super delicate-feeling. Every time I go to bed, I still feel them in my hands. I think we all feel very motherly towards them all,” said Leslie Ernst, a volunteer at SANCCOB. Katta Ludynia, a research manager at SANCCOB, said the chicks were in a terrible condition when they were brought to the rescue center. Most of them were dehydrated and small — some of them had just come out of the eggs,­ and had some infections. But over time, the chicks healed. “They are all stabilized, they get regular feeds of egg yolks, baby formula, prawns and fish and between the feeds, they are also given electrolyte fluids to aid their rehydration,” Ludynia said. The foundation members, however, were unsure if they would release the chicks in Kimberley or in the Western Cape after three or four months, by when the birds would have gained their strength and grown enough to be released. However, the shifting of the birds from Northern Cape to Cape Town, which was a 950 kilometer (590 miles) journey, caught the attention of not just the public but also made some conservation experts question the decision. Mark Anderson, CEO of BirdLife South Africa questioned the authority and the expertise that SANCCOB had in terms of moving the abandoned chicks. “These endearing little bids were apparently left stranded and dying by their parents as the waters of the dam dried up. [But] was the decision to step in and remove the abandoned chicks and eggs the right one,” he asked. Cape Town has been facing a drought problem since late 2017 and to tackle the prospect of the city running out of water, the South African government devised a plan where they announced “day zero” — a day when the people would turn off the taps all across the city, forcing people to communal water collection points. While this caused certain amounts of panic among the people, it led to a huge reduction in water consumption and day zero was averted after some time. However, people are still affected by drought. Conservation experts also said till the water began to recede, the Kamfers Dam was a “reliable refuge for waterbirds in a semi-arid area where wetlands are scarce.” The dam was also a site where more than 60 species of water birds were recorded and it held more than 20,000 birds, a vast majority of which were the Lesser Flamingos.